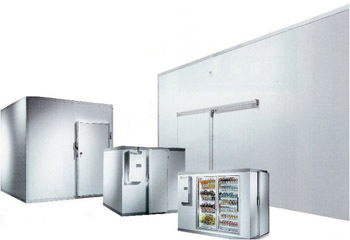 Walk-in Coolers, Freezers, Quick Ship Units. Walk-in Coolers. Indoor. Quick Ship. 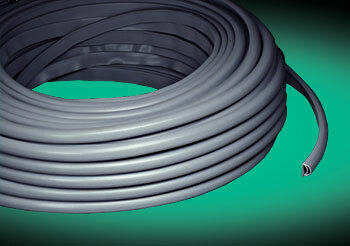 Refrigeration sysstem included. Refrigeration system: Self contained (plug-in,ceiling mounted) has a flush coil which keeps all components outside, allowing more storage inside. Ceiling mount refrigeration standard, wall mount refrigeration available for an additional charge. Panels constructed of 26 gauge embossed WHITE galvanized steel with aluminum coating. 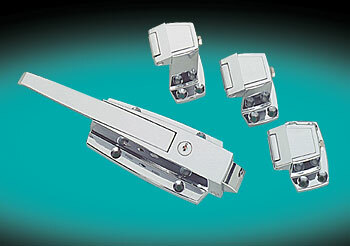 Doors feature two heavy duty cam-lift hinges, locking handle with inside release, magnetic gasket . Digital thermometer, vapor proof light. In Stock. In Stock. Please allow 24-48 hours for order processing. Walk-in Coolers. Indoor. Quick Ship. 1 Year Parts, 90 Day Labor. Refrigeration system (ceiling or wall mount) has a flush coil which keeps all components outside, allowing more storage inside. Panels constructed of 26 gauge embossed galvanized steel with aluminum coating. .080 Smooth aluminum floor (floorless models also available). 7'4'' Height (less floor) units available. Standard temperature for Coolers is +35º F and Freezers are -10º F.
4'' Thick for Coolers, 6'' for freezers insulation. Doors feature two heavy duty cam-lift hinges, locking handle with inside release, magnetic gasket and posi-close door closer. 6' 11'' Interior height (7' 7'' exterior) will accept most shelving.